FlowWest at the AI for Earth Education Summit in Redmond, WA! Sadie Gill from FlowWest is at Microsoft's AI for Earth Summit in Redmond, WA this week! The conference is focused on the latest technology in machine learning and other tools on Microsoft’s Azure cloud computing environment and how AI can solve pressing environmental challenges. Sadie is leading our ongoing work quantifying floodplain habitat for anadromous fish using remote sensing and machine learning, and she’s presenting this work at the conference. FlowWest at the 2018 California Safe Drinking Water Data Challenge! Click the image to see the tool! FlowWest is a proud participant in California's 2018 Safe Drinking Water Data Challenge. We answered the call to show our commitment to open water data by using open water quality data to develop an effective tool that will help ensure that safe drinking water is available to every Californian. FlowWest data scientist Sadie Gill partnered with CALPIRG's public health advocate Laura Deehan and visual journalist / interactive web developer Lo Benichou. Our team used data released by the San Francisco Unified School District and found that half the schools contained lead in the drinking water. 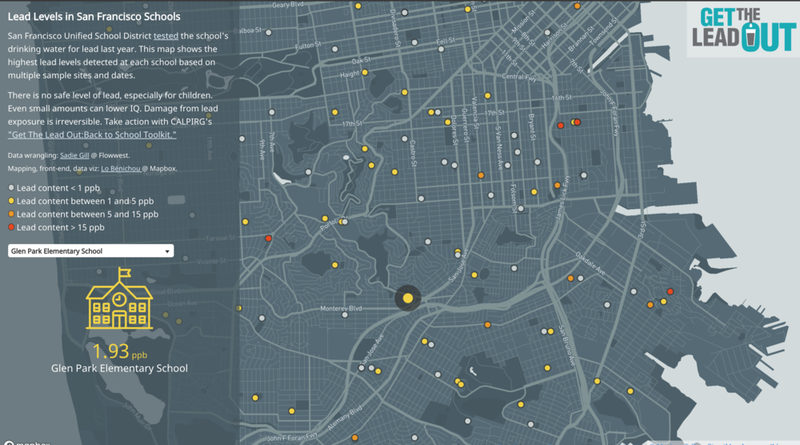 Our data visualization tool maps each school based on its lead level. The tool makes clear the unsafe lead levels in schools to community members and links to resources to help concerned citizens take action. An award ceremony and summit concluding the Safe Drinking Water Data Challenge will be held October 18th in Los Angeles. Cache Creek Resources Management Plan Receives 2018 CSAC Merit Award! The California State Association of Counties has just released its 2018 Challenge and Merit Awards for innovative programs. Out of 275 applicants, 15 programs received Challenge Awards while 36 received Merit Awards. Our long-time client, the County of Yolo, received a Merit Award for the Cache Creek Resources Management Plan (CCRMP). We’re proud to be working with Yolo and the rest of the CCRMP technical team to make Cache Creek a more sustainable, healthy ecosystem and better resource for all! Oakland, CA – June, 29 2018 - FlowWest has been awarded an AI for Earth grant from Microsoft to help further our efforts in advancing the quality of information describing salmonid habitat using machine learning and satellite imagery. This new grant will provide FlowWest with cloud computing resources to accelerate our work on new and improved methods to quantify floodplain habitat at the landscape scale. Outputs from this work will assist resource managers in their efforts to restore salmon populations and other floodplain-dependent species. Our project will provide information needed to make floodplain restoration and management decisions data-driven and trackable. AI for Earth is a Microsoft program aimed at empowering people and organizations to solve global environmental challenges by increasing access to AI tools and educational opportunities, while accelerating innovation. AI for Earth grants provide Azure compute resources and AI tools to NGOs, academic institutions and research organizations that work on challenges in climate change, biodiversity, agriculture and water. FlowWest is one of the newest organizations to be recognized by Microsoft for its impact and potential, and will join a growing number of AI for Earth grantees worldwide. FlowWest completes Goldmann Sachs 10,000 Small Businesses Program! FlowWest is proud to have completed the Goldman Sachs 10,000 Small Businesses (10KSB) program. We are excited to implement our new strategic growth plan to bring the power of Open Data and Open Source solutions to water resources management, and to create lots of exciting and rewarding new jobs along the way! Please let us know if you’d like to hear more about where FlowWest is headed in the new Open Water Data world. FlowWest is a proud sponsor of the Water Education Foundation’s 40th Anniversary celebration that will take place on October 26, 2017 in Sacramento. With four Water Leaders program alums (Anna Constantino 2016, Paul Frank 2010, Mark Tompkins 2000, and Mike Urkov 1999) in our ranks, WEF is in our DNA! Congratulations to a great organization on forty years of amazing work on California’s water resources. Shiny is a powerful web framework for building attractive interactive data visualizations with R. While the Shiny UI defaults are sufficient, knowledge of HTML, CSS, and Bootstrap enable developers to gain full control over the layout and styling of their Shiny web apps. Sadie is excited to share the tips and tricks she has learned while at FlowWest so that others can make prettier apps too! Anna Constantino to Present at ASCE EWRI Congress in Sacramento on Monday, May 22! On Monday, May 22nd, Anna Constantino will be representing FlowWest and the Water Education Foundation 2016 Class of Water Leaders at the ASCE EWRI Congress in Sacramento. Her presentation will highlight several recommendations from Strategies for Achieving Water Sustainability—written by the Water Leaders Class of 2016 to address California’s challenges achieving water sustainability in supply, demand-side management, laws and governance, funding, public education and data. Our strategies for achieving water sustainability range from revising the language in outreach messaging to investing in technological innovation to further our understanding of climate change impacts on our watersheds and communities. A common theme within the recommendations is capitalizing on the engagement of local stakeholders such as local governments, citizen scientists, farmers, tribes, students and more. After a year of researching and developing the report, the we found that by putting more responsibility in the hands of local water regulators, managers and users, California can address several important sustainability goals. These include improved water data transparency and access, greater understanding of watershed science and processes, broader restoration of critical habitat, and improved water use efficiency. We also highlight the exigent need for state and federal governments to act to meet sustainability goals. These actions include investing in infrastructure repair, reformulating permitting structures and supporting the expansion of water markets. The strategies presented in the report and summarized in Anna’s presentation on Monday were developed by the diverse group of Water Leaders 2016 alumni, including engineers, farmers, lawyers, policy analysts and more, and reflect the group’s vision for a sustainable water future in California. Please stop by the Exhibit Hall on Monday to delve deeper into these topics with Anna. Also, FlowWest is looking for a planner and an engineer to join our team! Stop by and chat with Anna to learn more about our dynamic group with offices in Oakland and Sacramento. EN2017 is the national meeting for the EPA’s Exchange Network and E-Enterprise programs. Anthony Falzone from FlowWest will present on Wednesday at 1:30 in Session 8 on work FlowWest completed for the Klamath Tribes. Mr. Falzone’s presentation will show how the Klamath Tribes and FlowWest used the Exchange Network to harness the power of the Tribes’ rich collection of water quality information and will highlight data visualization tools developed for ecosystem managers. The presentation will be webcast live. Click on the link ( http://www.exchangenetwork.net/en2017-agenda/ ) to open the agenda and then click on the hyperlink for the webcast for Session 8: Innovations in Water Monitoring Data to catch the presentation on Wednesday at 1:30 (eastern time). The presentations will be archived on the Exchange Network’s website for viewing in the future ( http://www.exchangenetwork.net/meetings-and-events/en2017/ ).